Belted kingfishers (Megaceryle alcyon) are one of the many species in the kingfisher family. They have a wide range -- all across North America, Central America, Greenland and some northern parts of South America -- so it's likely you'd be able to spot one if you know where to look. Belted kingfishers are distinctive birds that wouldn't be hard to pull from a line-up. Their backs and head are blue-gray and their breasts are white, apart from a blue-gray band that runs across the upper part of the breast. Females also have a rust-colored band slightly below the other one. They have prominent crests on their heads and have long, straight, pointed bills. On average they measure 13 inches in length and weigh around 5 ounces. 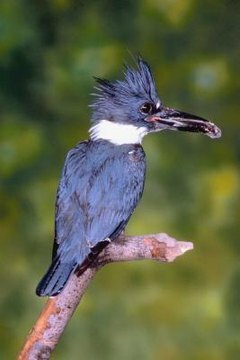 Belted kingfishers can be characterized by the type of habitat in which they live. As they hunt in water, they need to live near a body of water, such as a pond, lake, river or stream. They prefer to live near forests or wooded areas, and they need to have steep, near vertical exposed earth banks in which to dig nesting burrows. These birds prefer to stake out a territory where there's clear, smooth water and plenty of perches, as this makes hunting easier. As solitary creatures, belted kingfishers live alone, except during breeding season. They're diurnal, which means they're active during the day and spend the night resting. To protect their territory, or when they feel threatened, they either fly up and down along the water, making loud, rattling calls, or land on perches, move their bodies up and down and raise their crests. They're generally non-migratory, as they tend to live in areas with fairly mild winters, but they will move in the colder months if food is scarce. Although their main food source is fish, belted kingfishers are opportunistic feeders and will eat anything from berries to insects to small birds and mammals. Most of the time they'll practice still hunting, where they find a perch over the water to sit on, then wait until they spot some prey so they can dive down to catch it. However, in the absence of a decent perch, they'll hover over the water until they find some prey. They can consume fish up to nearly 7 inches in length.